You’ve seen this movie before, or at least one like it. In a shadowy city, a secret agent is deep undercover, sitting on classified information that somehow needs to make it into the right hands. If it’s intercepted, he’ll face certain death. So he writes his carefully coded notes in invisible ink. The premise is familiar enough. But this time, there’s a twist: The ink isn’t just invisible. It’s alive. This “living ink” is the brainchild of the Tufts chemists David Walt and Manuel Palacios. It’s made of genetically engineered E. coli bacteria—seven strains of it, to be exact. Each one glows a different hue when exposed to blue light, creating a color-coded message. “We had worked with some chemical methods for a while, and said, ‘Well, we can send messages with chemistry, so maybe we can think of a way to send them with biology,’ ” says Walt, the Robinson Professor of Chemistry in the School of Arts and Sciences. Using biological systems to send secret codes is nothing new—the geneticist J. Craig Venter famously wrote a coded message into a molecule of DNA back in 2008. But DNA has its limitations when it comes to cryptology. To synthesize it and read the information it contains, you need a lab full of incredibly sophisticated equipment. Walt and Palacios, a postdoctoral associate in chemistry, wanted something much simpler. Enter bacteria. Thanks to developments in biological engineering over the last decade, it’s relatively easy to design a microbe that looks and acts according to a predetermined plan. Add one type of fluorescent protein to the cell’s genes, and it will glow green. Throw a different one in there, and it’ll glow red. By simply dabbing tiny spots of these bacteria on a sheet of nitrocellulose, a paper-like substance, it’s possible to create a coded message. A pair of yellow dots, for example, could represent a “T”; a red and green dot, an “S”; and so on. Walt and Palacios call messages like this SPAM, or Steganography by Printed Arrays of Microbes. If you’re not familiar with steganography (don’t worry; I had to look it up, too), it’s the art of hiding messages in plain sight. Bacteria are, after all, microscopic, which makes them virtually undetectable. This trait alone offers a certain level of security. But it’s the biological machinery inside those microbes that really makes SPAM work. 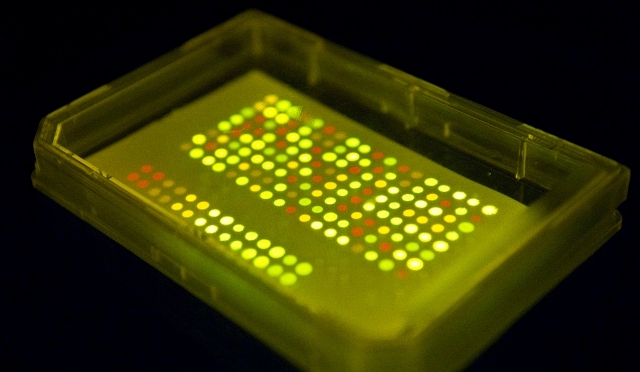 In addition to creating bacteria that glow in different colors, Walt and Palacios also designed strains that can be grown only in a specific broth of nutrients—meaning that unless the recipient of a SPAM message “develops” it with the right formula, he or she won’t be able to decipher its contents. It’s possible to achieve even higher levels of security by attaching fluorescent proteins to genes with a specific function. Add antibiotic-resistance genes, and the message appears only in the presence of ampicillin or another antibiotic compound. By including additional genes, Walt says they can also write messages that will reveal themselves over the span of days or weeks—or even create ones that self-destruct, à la Mission Impossible. While it’s easy to imagine the CIA using SPAM, both Walt and Palacios say it’s unlikely that secret agents will be embracing it any time soon. The technology just isn’t robust enough right now. Still, the chemists think that it has a commercial use as a biological bar code for high-value items. Walt, for one, imagines drug companies using SPAM-encoded labels to identify counterfeit goods or items that have been tampered with in transit. Since publishing their work in the Proceedings of the National Academy of Sciences last month, Walt and Palacios have been fielding calls from journalists around the globe. But Walt says the international attention won’t change the direction of his primary research, which involves high-sensitivity detection of proteins and DNA. Originally written for Tufts Now news website. Published on October 24, 2011.